LOCATION.--Lat 41`16'01", long 77`02'49", Lycoming County, Hydrologic Unit 02050206, 150 ft downstream from concrete bridge on U.S. Highway 15, 1.2 mi downstream from Beautys Run, and 3.4 mi upstream from mouth. PERIOD OF RECORD.--1908-1913, (continuous-record site operated by the Pennsylvania Department of Forest and Waters. Published as "at Bridge No. 2, near Williamsport). 1982-1987, (low-flow partial-record station). 1988-1990, 1995-2018, (continuous record-annual peak site). October 1, 2018 to current year, operated as a stage-only site. GAGE.--Water-stage recorder. Datum of gage is 530.12 ft above North American Vertical Datum of 1988. Satellite telemetry at station. REMARKS.--Daily discharge not available. 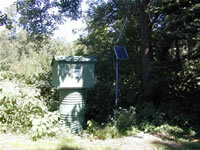 The streamgage cannot record stream levels below a stage of 1.56 feet.